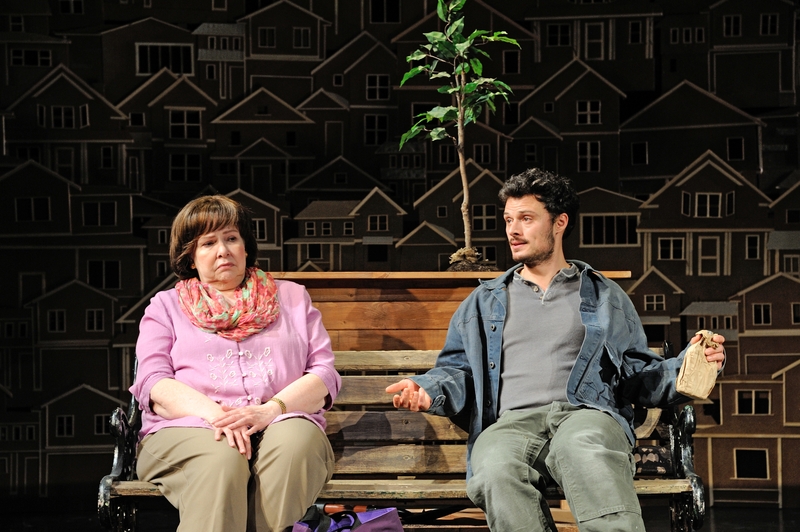 Mauro Hantman as John Dodge and Angela Brazil as Mrs. Swanson in Will Eno’s Middletown at Trinity Rep. Directed by Curt Columbus, set design by Deb O, costume design by Alison Carrier and lighting design by Josh Epstein. Through February 22, 2015. Photo Mark Turek. PROVIDENCE — Will Eno’s “Middletown” is a place with quirky and interesting characters, but in the production directed by Curt Columbus at the Trinity Repertory Theatre, it’s hard to find a there there. “Middletown” has drawn comparisons to the Thornton Wilder classic “Our Town,” but I don’t see the strong connection, other than in its intimate depiction of small town life and the drama to be mined in the lives of ordinary residents of such towns. The characters in “Middletown” are on their own for the most part, while Wilder had his Stage Manager to serve as the guide to the unfolding events and to allow the time frame to shift dramatically. Eno’s characters are more introspective — make that much more introspective — and while there are plenty of profound moments and some inspired dialogue, there is also a generous amount of navel-gazing that gets to be a bit tiresome after a while. “Middletown” does get off to a strong start with nonpareil Trinity mainstay Fred Sullivan Jr. as the Public Speaker, introducing the piece with a hilarious rant welcoming any kind or type of person, a tribute to the nonsensical, endlessly inclusive political correctness of the times we live in. Standing on its own, it’s funny. Whether it makes sense as part of the larger piece is another story. Thankfully, Sullivan will return twice more, once as a cynical tourist and later as a doctor working to calm a nervous mother with some sage advice before she gives birth. 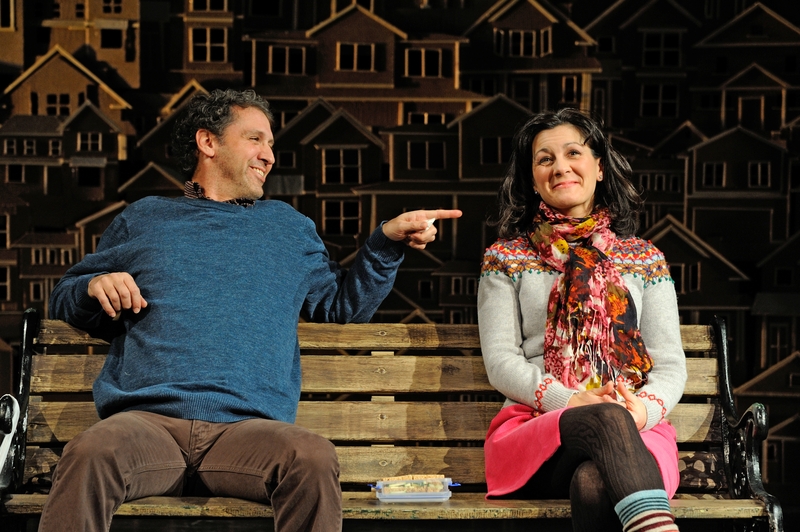 Janice Duclos as Librarian and Lee Osorio as Mechanic in Will Eno’s Middletown at Trinity Rep. Photo Mark Turek. With the benefit of a rather dazzling display by lighting designer Josh Epstein, Justin Blanchard portrays a Middletown native turned astronaut whose musings as he circles the earth puzzle Mission Control. Mauro Hantman is John Dodge, a handyman of sorts adrift in life who suffers from near-constant panic attacks and a woeful lack of self-esteem. He strikes up a friendship of sorts with Mrs. Swanson, whose husband is perpetually absent — perhaps he doesn’t even exist. One of the best performances in the piece is by Lee Osorio as a drunken mechanic — I don’t think I’d want him working on my car — a lost soul who engages the other residents in many different, interesting ways. Some profound stuff emerges from his character’s mouth, including this reply when Rachel Warren’s doctor — who takes pity on his drug addiction — asks him what he wants from life. “I want to know love on this earth and to feel beautiful.” No bad for a mechanic with a drinking problem. Joe Wilson Jr.‘s cop on the beat is the first one to give us the lowdown on the town, but he also shows a disquieting predilection towards violence before suddenly reversing course and becoming a solicitous caretaker. And, again, there are those quirky, discordant moments such as when some of the cast pretend to be audience members reacting at intermission to what they’ve seen thus far. Pacing is a problem, although I would put that at the feet of Eno and not with Trinity Rep Artistic Director Curt Columbus, who directed. The ending — which involves John Dodge and Mrs. Swanson and which can even be seen in advance by the astronaut orbiting in space — is, like the gimmick with the fake audience and the Public Speaker — almost too precious. Deb O’s set design displays small models of the home the person lives in displayed alongside them, with the backdrop a 3-D collection of homescapes one atop the other, suggesting an anonymous, undistinguishable landscape of residences. “Middletown” is not an awful place to visit. I just wish there was more there when you got there. “Middletown,” by Will Eno. Directed by Curt Columbus. At the Trinity Repertory Theatre’s Dowling Theatre, 201 Washington St., Providence through Feb. 22. Tickets $30-$71. (401) 351-4242, or trinityrep.com.